You know what people had back in the early 90s? Hair. Lots of it. And lengths of it. The 80s had been all about short hair - power crops, curly bobs, the odd big pixie cut. But the 90s was all about re-discovering femininity. Business suits and shoulder pads were tossed aside for floaty, wispy rayon dresses, and cheesecake cloth skirts. We also grew our hair long again - 'cause nothing screams "I'm a woman" than a scrunchie-clad ponytail. But this is not about the scrunchie, nor the poor check-out lady at my local Woolworths who's still fighting a one-woman battle to keep the scrunchie relevant. This is about a device that exploded in popularity because it allowed you to do fancy things with your new long hair. It literally turned the hair world topsy turvy. Topsy Tail was simply a bit of looped plastic that you would deploy to flip a ponytail inside itself, giving you a classy French-twist-esque style. The legitimate Topsy Tail was invented by businesswoman Tomima Edmark, but of course, I didn't buy that one. No, it wasn't long before $2 shops undermined Edmark's informercial juggernaut, so my Topsy Tails were inventive knock-offs with names like "Stylish Hair Tool". Skilled Topsy Tailers could get more sophisticated, trying such decorative styles as "The Banded", "The Partial" and "The Double". Due to a love of period dramas, such as the BBC's Pride and Prejudice, my favourite became "The Victorian", in which you'd tuck the bottom of the ponytail up behind the topsied bit, giving you the windswept look of a Brontë heroine. Well, that's what I liked to think anyway. 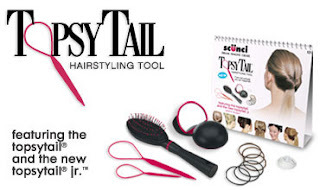 I was sad to read that Topsy tail inventor Tomima Edmark has never recreated the success of Topsy Tail. Mind you, that little piece of plastic ran up at least $120 million in sales, so I daresay she's not crying herself to sleep. Of course the ultimate irony is that you don't really need a Topsy Tail device to achieve the Topsy Tail look. I wonder if people would be interested in having a communal celebration of this once-beloved hair-styling product? We could have a "Topsy Tail Tuesday", and post photos of our own Topsied styles on Facebook or Twitter. Who's in? Thats exactly it, everytime I see your photos or video I think "mm Bronte Heroine".